HEN explaining square notes people are stumped by these notes stacked one on top of the other. It takes a little while for singers to automatically start at the bottom of the stack. The notation came from what worked writing with a broad nibbed pen on vellum. It didn’t translate easily to lead type, or computer software. Then Elie Roux appeared suggesting we could simplify the code with something like ABC notation. It seemed a mad idea. Gregorian notation is not like modern music. 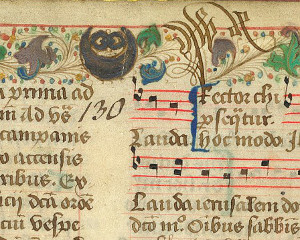 There are all those different neumes: punctum, podatus, torculus, climacus. How would you hope to specify the pitch and shape of each note as well as the fine gradations of spaces. After a while he came up with GABC and Gregorio. This used a markup language with similarities to ABC plus a processor to typeset the music using TeX. This was very exciting to those already familiar with TeX and old fashioned text based software, but most of the musical population would smile and nod with a slightly glazed expression. Then there was the idea to share GABC files at the Caecilia Project, but the interface was clunky until recently when Olivier Berten released Gregobase. Now you have the editable GABC for the geeks alongside handsome pdf, eps and png files ready to paste into the desktop publishing program of your choice. There are also scans of the original music for proofreading purposes. I might have to leave the GABC transcriber for another post. Go check out Gregobase.